We may all believe that contemporary American politics is a series of intellectual exchanges between people who have learned to overcome their philosophical differences and engage civilly with one another, but sometimes politics can get ugly. Like, name-calling, racism ugly, as in the case of a series of tweets from the Kentucky Progress about former Labor Secretary Elaine Chao, the wife of Senate Republican Leader Mitch McConnell. According to NBC, McConnell criticized the liberal organization's tweets as "racial slurs" and "the ultimate outrage." McConnell, who is gearing up for a tough reelection bid in Kentucky next year (which might pit him against Ashley Judd), told a room of about 100 home-state supporters in Winchester, "They [Kentucky Progress] will not get away with attacking my wife in this campaign." And what bit of Twitter ignorance prompted McConnell's ire? Back on Feb. 14, a Kentucky Progress Group volunteer newly enamored with hashtags tweeted about Chao, "This woman has the ear of @McConnellPress - she's his #wife. May explain why your job moved to #China!" Chao, just for the record, was born in Taiwan. McConnell's public display of outrage comes after a Louisville public radio station aired reports on the Twitter fiasco, prompting Kentucky Progress to issue two apologies over the past week and fire the offending volunteer. 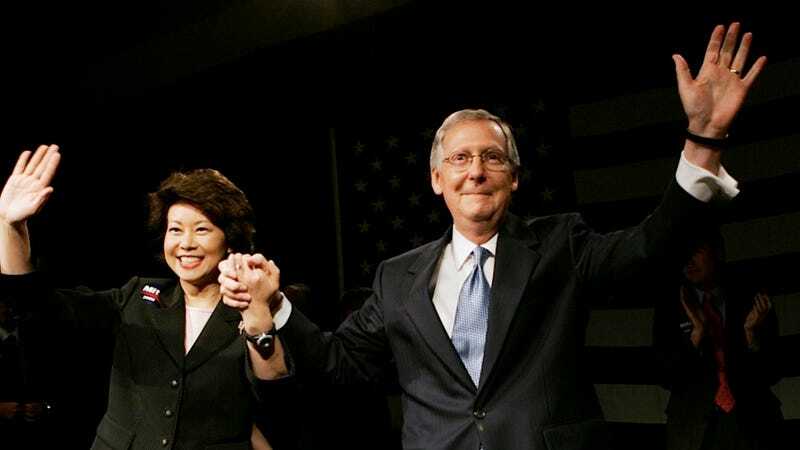 The Twitter attack marked the second time Kentucky Democrats decided that the best way to criticize Mitch McConnell would be to make a xenophobic joke about his wife's fictitious Chinese heritage. In 2001, according to NBC, former state Democratic Party chairwoman Nikki Patton had to issue her own apology after grossly quipping that McConnell "passed up some good Kentucky pork to chow down at the Chinese money buffet." Oof. Certainly Kentucky Democrats can do way better than this.